This Nile Scribes series allows our readers to learn more about Egyptologists from around the world. From questions about their life and their career, we also explore their research interests and their impact and perspectives on the field of Egyptology. We want to use this series to help strengthen the public’s awareness of the Egyptological community, and to illustrate the varied careers and on-going research projects within the discipline. In this edition, the Nile Scribes spoke with Dr. Kerry Muhlestein from BYU in Provo about his life and research. Who is Dr. Kerry Muhlestein? We had the pleasure of meeting with Dr. Kerry Muhlestein at the SSEA’s 42nd Symposium earlier this month (read about the symposium here) where he presented on his excavations at Fag el-Gamous, and afterward graciously agreed to an interview. He completed his PhD in Egyptology at the University of California in 2003 and is currently Professor of Ancient Scripture affiliated with the Department of Ancient Near Eastern Studies at Brigham Young University. He also currently serves as the Vice President of the Society for the Study of Egyptian Antiquities. Nile Scribes: Where are you from and where were you educated? Kerry Muhlestein: I am from Sandy, Utah, about half an hour south of Salt Lake City and half an hour north of Provo. I did my undergrad at BYU in Psychology. Part way through my undergraduate years I realized how much I would like to teach and how much I loved the ancient world. I was originally most fascinated with the world of the Bible, so I started to study Hebrew and courses associated with the history of the Bible. I ended up graduating in Psychology (with an emphasis on social and cultural psychology) and a minor in Hebrew. NS: How did you get started in Egyptology? KM: I immediately started a Master’s program at BYU in Ancient Near Eastern Studies. While my emphasis was in Hebrew Bible, I soon realized how much I had fallen in love with the world of Ancient Egypt. In particular, their facility with symbols drew me in. I started taking any kind of course I could find that was connected with Egypt, and in all my courses if there was a project that could be Egyptian in nature, I did that. I applied to Ph.D. programs in Egyptology. I was about to go to the University of Pennsylvania when Antonio Loprieno, of UCLA, came to lecture at BYU. After hearing his lecture, and taking the time to visit with him for a while, I realized that my research interests coincided with his perfectly. So I applied to UCLA and went there. Having already taken a number of courses in Hebrew, Aramaic, Ugaritic, Akkadian and Coptic, I was able to pick up Egyptian fairly quickly. Part way through my time at UCLA, Willeke Wendrich came there, and I ended up working very closely with her as well. I have always felt very blessed to have been able to work so closely with both Dr. Loprieno and Dr. Wendrich. A person could not ask for a better one-two philological and archaeological punch. They both very much took me under their wings, and I continue to feel like they are family. At UCLA we were also blessed to have a regular round of visiting professors from whom I could take classes. People like Gilles Roulin, Chris Reintges, Zahi Hawass, Monica Bontty, Katja Goebs, and Anson Rainey were a genuine pleasure to take classes from. NS: What is your favourite museum with an Egyptian collection? 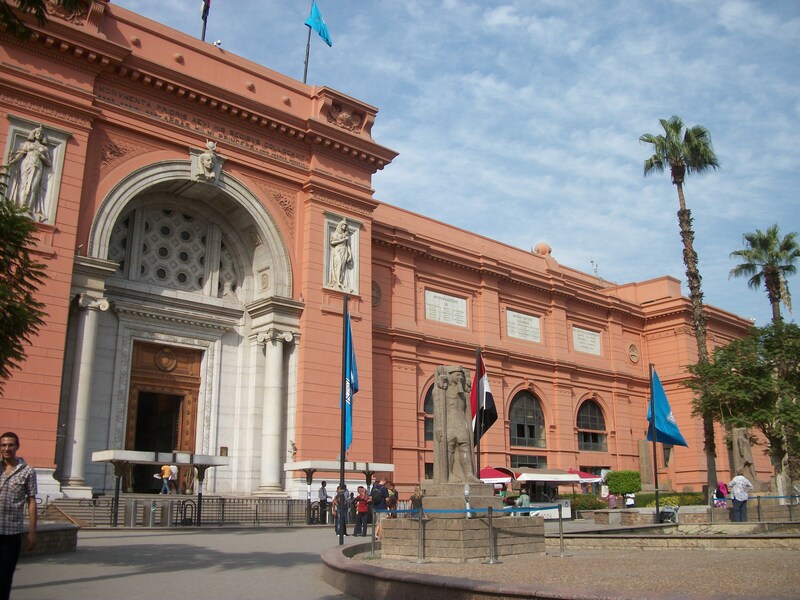 KM: I think my favorite museum is a tie, between the Egyptian Museum in Cairo and the Turin Museum in Italy. NS: Can you tell us about your first trip to Egypt? KM: I was going to work at Berenike with Dr. Wendrich. I went a week early on my own dime to see Egypt. I had never been before and I was halfway through my Ph.D. program and really wanted to see some of the things I was studying. I ended up in a hotel with a bed that was too short for me (and I am not tall). The mattress went over both the headboard and footboard, so that I slept in a U-shape the whole time. There wasn’t a chair in the entire hotel. I remember after several days I just wanted to sit down in a chair for a minute, so I walked to the Nile Hilton. It took me awhile to get there; I hadn’t yet figured out how to cross a street in Cairo (which is not as easy as it may sound). I finally figured out that if I just found a local and ran when they ran, I would be okay (this was the same method I used for getting on and off busses, which also wasn’t easy). I made my way to the Hilton and sat in their lobby for a while, just enjoying sitting down. That half an hour was a little haven for me from the busy honking of Cairo. I was also fortunate that I was able to find a very small local congregation from my church, and soon they had taken me under their wings, inviting me over for dinner and taking me with them on 4-wheel drive trips to places I still haven’t been able to return to. Still, I will always remember my chair in the Nile Hilton with great fondness. It was on this trip I also learned that I love Cairo and I love the Egyptian people. The people and places of Egypt have become an integral part of my heart. KM: I have spent all of my excavation time in Egypt with the BYU Egypt Excavation Project. I was brought on as the assistant director, always with an eye towards the fact that the director was close to retirement and that he wanted me to keep the project going after he retired. He had a little initiation that he put people through when they went to the site for the first time. 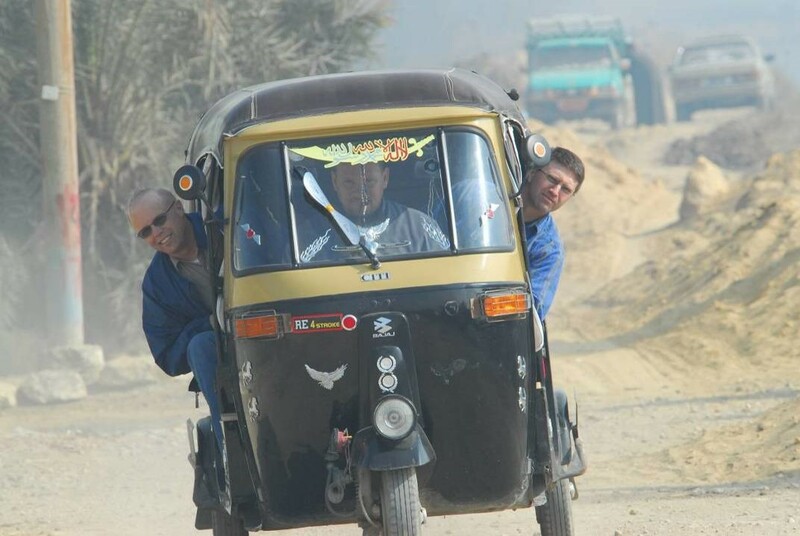 He would have us take a tuk-tuk for the last half hour on dirt roads, and then have us stop and cross the canal next to the site on a “bridge” he had built for our workers. The bridge was four barrels tied together and then tied to a cable that spanned the canal. If you could keep your balance on the “bridge” and get across the canal, you were part of the excavation. I am glad to say I made it across nice and dry. NS: What fascinates you most about ancient Egypt? KM: I am most drawn to the ancient Egyptian facility with symbols. How were actions symbolic? How do text and art interact with each other? How can the same symbol be reinterpreted in different contexts? How did symbols interact with the perception of everyday life? All of these questions continue to fascinate me. NS: What are your primary research interests? KM: One of my primary research interests is in sacred violence in Egypt. I got interested in this because I had taught, like so many others, that the Egyptians did not engage in human sacrifice. Then I encountered an example of human sacrifice that Robert Ritner had written about. I was interested in why we had all said this never happened, and yet it clearly had. I was interested in the religious reasoning behind why such a practice would or would not have happened. These questions lead me into some very fruitful fields of research. I am also very interested in religious change. This works well with my excavation because on one hand we are working on a pyramid built by Snefru. It is part of the puzzle of how true pyramids were built and why. It also is part of the transition from north-south orientation of pyramids to an east-west orientation. This is a real time of religious change. We also have a Greco-Roman cemetery. During the lifetime of this cemetery its inhabitants converted to Christianity, another epoch of religious change. These questions fascinate me. NS: If you could travel back in time to see one ancient Egyptian city, which would it be? KM: If I could travel back in time, I would go back and see what Snefru was doing with building his four pyramids in the manner and places he did. This is a question that wakes me up at night, trying to figure out what is going on with the Seila Pyramid and its relationship with the Meidum Pyramid. Just give me a few minutes with Snefru and I will be happy. 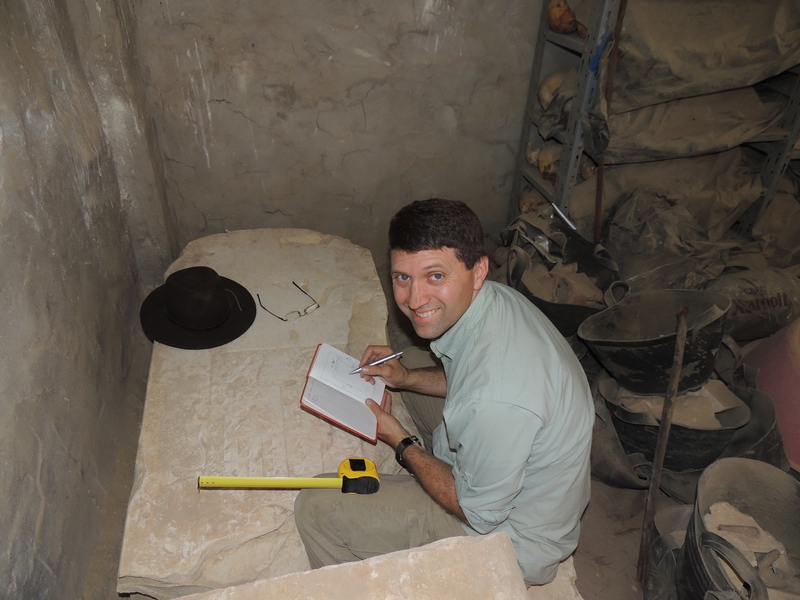 KM: I am close to finishing a book about the work of the BYU Egypt Excavation Project. It will have chapters on the ritual program of the Seila Pyramid, about how the poor people of the Roman era in that area buried their dead, about mummy portraits found in that area, the translation of a papyrus fragment we found, and a bunch of other things. I think a lot of great stuff will come from the volume. After that, my next big project will be to publish the excavations of the Seila Pyramid. There is some information we still need to gain, so I plan in upcoming seasons to re-excavate a few parts of the pyramid so that we can better publish it. NS: What are your biggest hopes for Egyptology? KM: As I did this research I realized that so often I was dealing with circular arguments. People would encounter evidence for ritual violence, but would dismiss it because of a belief that the Egyptians didn’t engage in such practices. The next person to encounter evidence would dismiss it based on the same reasoning, and would cite the earlier person who had dismissed their evidence. In the end an assumption was used to dismiss all sorts of evidence. It is my hope that we will more and more question our assumptions, and become better and better at letting evidence speak for itself. I think sometimes we fall so in love with the cultures we study that we want them to look the way we think they should look, rather than letting them look how they would have presented themselves. We have to avoid this tendency. NS: How do you think students can prepare more efficiently for a career in Egyptology? KM: I still believe that one of the best things Egyptology students can do is to prepare themselves to be better historians. Taking classes in historical method will help them be better Egyptologists and help them be more employable. I still hold to the advice I gave in the first volume of the Journal of Egyptian History (1), about how much easier it is to find a job if one possess historical skills. We need more Egyptology students to find jobs, so I highly recommend doing anything that makes a person more employable. The number of Egyptology posts is low, the number of history posts is high. Just do the math. NS: If you had to study something else besides ancient Egypt, what would it be? KM: The wonderful thing about working with ancient Egypt is that it will never cease to surprise us. No matter how much we think we know, she has more secrets to yield to us. I don’t expect to quit being surprised by Egypt in my lifetime. 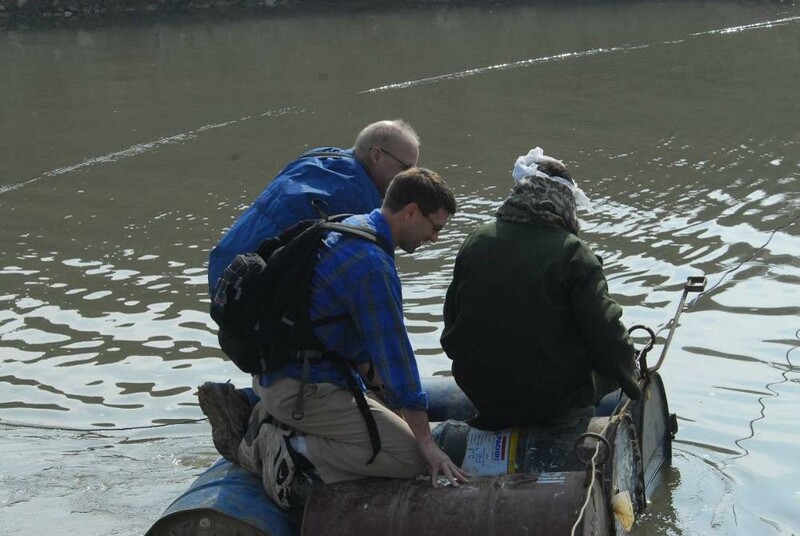 The Nile Scribes are grateful for Dr. Muhlestein’s participation in this series. If you have any questions for Dr. Muhlestein, you may contact him online through his profile below or leave a comment on the blog. 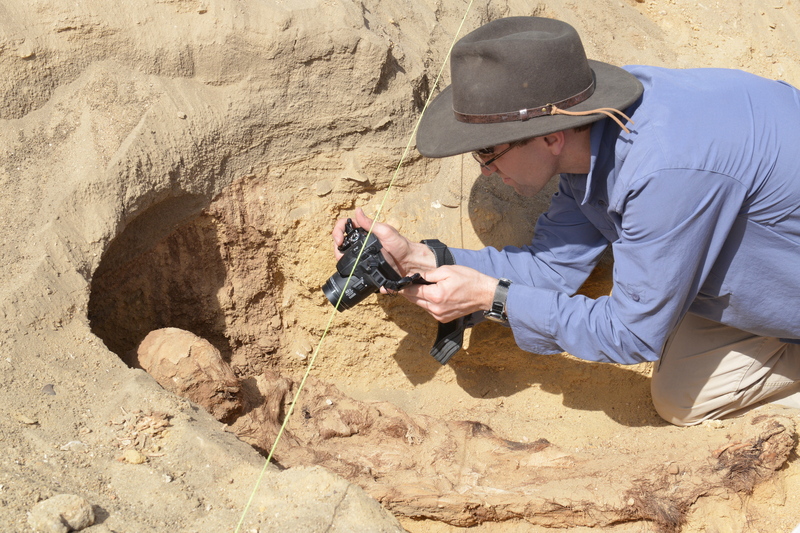 Unless otherwise stated, photos are courtesy of Dr. Muhlestein and the BYU Egypt Excavation Project. Muhlestein, Kerry. “Teaching Egyptian History: Some Discipline-Specific Pedagogical Notes,” in Journal of Egyptian History 2(1) (2009), pages 173-228.